Knowman has just announced the 8th edition of the Social Now 2019 conference. 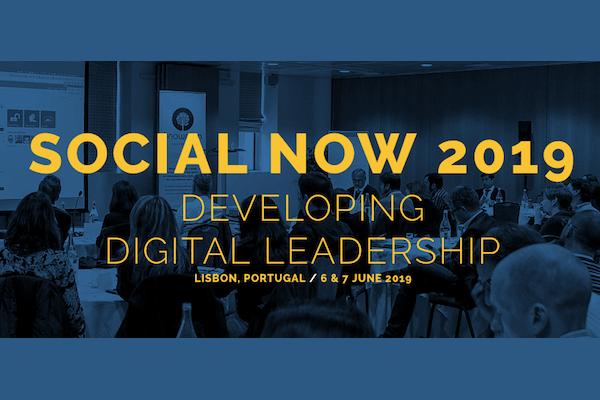 It will be in Lisbon, 6 & 7 June, and the main theme will be “Developing Digital Leadership”. how enterprise social tools may be used to (re)create processes and support true digital leadership. There are three speakers confirmed already – Céline Schillinger, Kenneth Mikkelsen and Lee Bryant – and registrations are open. Social Now is a conference organised by Knowman and focus on the use of enterprise social tools, or social intranets as also called. Year after year, speakers and participants from around the world highlight the quality of the agenda, the many opportunities for networking and frank debate, and the uniqueness of its format: most speakers go on stage to offer practical recommendations to a fictitious company – Cablinc – wanting to improve internal communication, collaboration, and knowledge sharing and retention.